Bright and vibrant, isn't it? In dreary weather this is the best dose of medicine for me. The color just lifts my mood and sends me joy. These photos were taken at a garden center some years back, but since I have to tap into my archive since it rains a lot this year. They surfaced again to grab my attention. 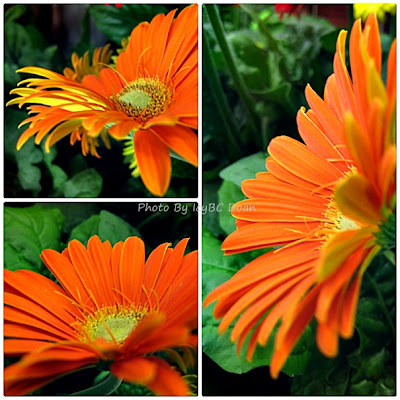 I hope this bright orange gerbera daisy photos bring a little joy to your world, especially when you are living in gray and wet weather like me. Above all, enjoy your weekend! They are one of my fave flowers! Lovely collage.